He stares down at his little friends day in and day out. Their passion and vigour amuses him. They treat him like their own and not once did they ask him for anything in return. They admire his beauty and love him dearly. Sometimes, their dangling feet make beautiful sounds against his skin. They belong to him and he belongs to them…the giant ferriswheel. Behind him Salman and his gang of tiny minions create a ruckus on his buddy — the mini roller coaster ride. It has been a month since the Pushkar Mela was held. The area that was once occupied by tens of thousands of animals and villagers now lies empty; abandoned by those who called it home for a while. The sea of plastic and garbage visible on the open landscape is vaguely reminiscent of the camel fair that took place in these soils. A stroll down the narrow roads will reveal a picture devoid of any activity or celebration. Though the mela is officially over, the giant rides are still seen hovering — tall and lifeless — over the market. After a few moments, there’s a resounding echo of laughter in the air. A group of ten or twelve kids who had occupied the roller coaster ride earlier are seen engrossed in a game of catch-and-release. 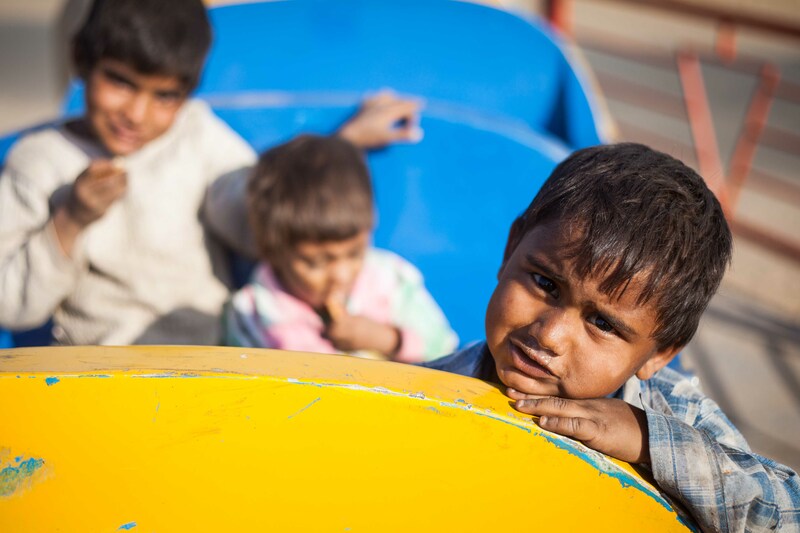 For these children, most of their childhood is spent on these giant life-sized toys. Today, the amusement rides have become their ‘imaginary’ best pals, a place to enjoy an afternoon siesta and perhaps their most exotic playground. But, most importantly, it is a place where they can leave all their worries behind and enjoy the warmth of joy; a place they can call home. Most of their days begin and end with spending time on these massive toys which are now being pulled apart a little by little everyday only to be re-assembled in another mela. It is an emotional journey for these tiny tots as they observe their gigantic friends – Ferris, Columbus and Rollercoaster — being torn to shreds; as they bear witness to a reality where dreams and fantasies cease to exist. They wait in anticipation for their friends to be brought to life. However, their fears and anxiety betray their emotions. And, as each of them lingers a little while longer around their lifeless companions, wondering how long do they have to wait this time to see their best friends, they secretly hope that they don’t have to move on. This is a story through the eyes of the children belonging to families that put up amusement rides for several melas throughout the country. While the children spend most of their time in the villages, their parents travel for eight months in a year. Whenever time permits, kids visit their parents and have a ball on the amusement rides.